Network with a vast, diverse, and knowledgeable group of policy-makers with this extensive data product from Bookyourdata.com! This ready-to-download list is full of professionals in the policy departments of companies, nonprofit organizations, and other institutions. Find them with this list! Those who create policy have a lot on their plates. They often need to ensure compliance with legal bodies as well as make guidelines for best practices, create rules for standard conduct, and ensure that these policies are communicated and distributed accordingly. They require a vast array of legal and professional knowledge as well as a procedural knowledge and an appreciation for “real life" practices within their organization. They are a powerful, important collection of individuals who often are required to make important decisions. If you can help them organize, express, change, and implement policies with your software, tools, or services, contact them with this list to let them know. 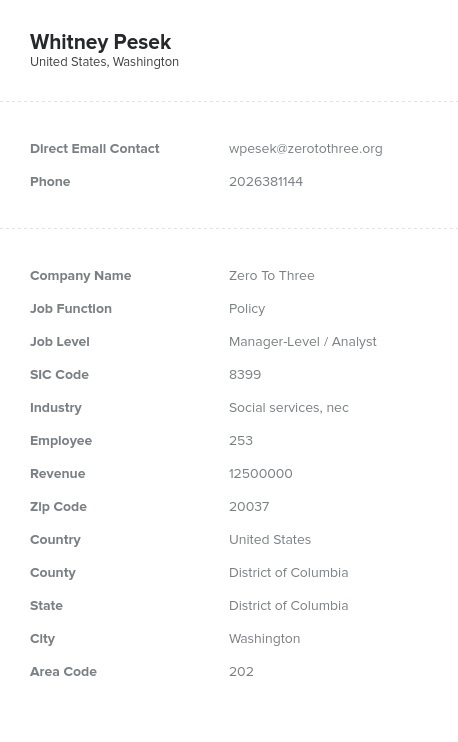 This data product is full of the essential contact information of those working in the policy departments of numerous companies and organizations. It's an extensive, premium directory, which contains the information you need to connect: emails, numbers, addresses, names, titles, and more. Find the people you need to speak to, and then directly contact them with this accurate information. Pull this list now to start connecting within minutes, or feel free to customize this list. You can also create your own, custom business lead list with our innovative list-builder.